Average condition. A few small spots in edge of page. I decided to develop a professional activity in 2017 and so I created a separate account for this purpose. Good condition. Interior in excellent condition, very fresh, near new. 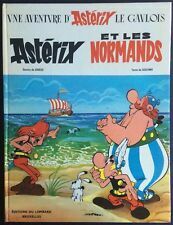 COMIC BOOK ASTERIX AT THE BELGIAN UDERZO, GOSCINNY 1979 EDITIONS DARGAUD. 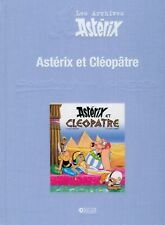 Asterix Omnibus, written and illustrated by Albert Uderzo. Orion, 2007. 161 pages. Condition: like new, with portfolio inside the book. Publisher: Editions Atlas. Lieu de publication Italie. Nom de publication Les Archives Astérix. Auteur Goscinny / Uderzo. Numéro de publication 978-2-7312-5059-6. Publisher: Editions Atlas. Nom de publication Les Archives Astérix. Objet modifié Non. Lieu de publication Italie. Auteur Goscinny / Uderzo. Numéro de publication 978-2-7312-5083-1. Séries Astérix et Obélix. Publisher: Editions Atlas. Nom de publication Les Archives Astérix. Printed in Italy. Date de publication 2013. Langue Français. Format Relié. Publisher: Editions Atlas. Nom de publication Les Archives Astérix. Numéro de publication 978-2-7312-5061-9. Lieu de publication Italie. Auteur Goscinny / Uderzo. Séries Astérix et Obélix. Langue Français. THE ASTERISK 1. Published by editions Albert René. Superb condition. Published by editions Albert René. Newspaper May - June 1999. BUBBLES CD. Date de publication 1989 à 1991. Objet modifié Non. Lieu de publication France Paris. Auteur Goscinny / Uderzo. Numéro de publication 17201. Séries Astérix et Obélix. Nom de publication Les Aventures d'Astérix. Asterix Le Combat Des Chefs Hardback 2001. French Text. Goscinny/Underzo. 48 page large format hardback book. Published in 2001. Text is in French. UDERZO / GOSCINNY. Set of 7 families. 03 87 36 90 55. UDERZO - GOSCINNY. THE ODYSS EA OF ASTERIX. EO 4th tr. 03 87 36 90 55. UDERZO - GOSCINNY. EO 2nd tr. 03 87 36 90 55. UDERZO - GOSCINNY. THE SON OF ASTERIX. EO October 1983. 03 87 36 90 55. 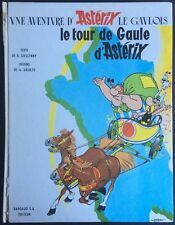 The Tour of Gaul of Asterix. Asterix Archives collection - Editions Atlas. 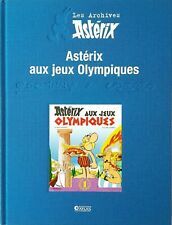 Asterix Aux Jeux Olympiques. Dargaud/De Agostini 1990. Soft-cover book with French Text, 48 pages, fine condition. Asterix Chez Les Helvetes. Dargaud/De Agostini 1990. Soft-cover book with French Text, 48 pages, fine condition. Asterix La Serpe d'Or. Dargaud/De Agostini 1990. Soft-cover book with French Text, 48 pages, fine condition. Asterix and the Chieftan's Shield. Asterix and the Black Gold. Asterix in Belgium. Asterix in Switzerland (mini version). The corners are slightly worn on each issue. Publisher: Editions Atlas. Nom de publication Les Archives Astérix. Language: french. Format Relié. Printed in Italy. Status: factory sealed. Asterix and the Magic Carpet by Uderzo UK 1988 HB with glazed pictorial boards (as published). Always collectable 1st Edition Asterix HB. Cacofonix's tuneless singing always makes it rain - which is just what they want in Rajah Watzit's distant Eastern kingdom. Asterix e lo Scudo degli Arverni. Mondadori, 1972. Hard-cover book with Italian Text, 52 pages, fine condition. Asterix e il Paiolo il Giornalino #34 - August, 1998. Mondadori, 1998. Hard-cover book with Italian Text, new. Il Figlio di Asterix. Mondadori, 1983. Hard-cover book with Italian Text, 50 pages, fine condition. 'PILOTE'. 1965. FRENCH COMIC. ASTERIX. SCARCE ILLUSTRATED COMIC. 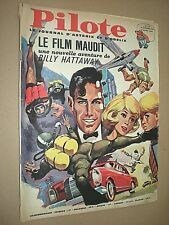 1960's French comic. In good condition, complete but with signs of use and age. It is written in German. This Book is in very good condition. Date de publication avril 1989. Format Relié. EO Editions Dargaud 1974. Uderzo and Goscinny Asterix 21 The gift of Caesar. Germany, United Kingdom, Belgium, Luxembourg, Spain, Portugal, Italy. GLOBAL RELAY. France, Belgium, Luxembourg. Weight up to. ASTÉRIX THE GAULS DISCORD GOSCINNY / UDERZO Ed. of the LOMBARD EO 1970. René GOSCINNY & Albert UDERZO. The LOMBARD EDITIONS. EO 2nd quarter 1970. An adventure of ASTERIX the Gaul. René GOSCINNY & Albert UDERZO. AN ADVENTURE ASTERIX THE GAULS. The LOMBARD EDITIONS. EO, DL Q2 1973. 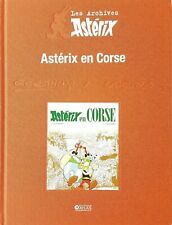 ASTÉRIX in Corsica. ASTERIX VOL. 5 UDERZO / GOSCINNY INTEGRAL ROMBALDI 1990. EDITIONS ROMBALDI, DL October 1990. Goscinny & Uderzo. ASTERIX THE GAUL. INTEGRAL ASTERIX THE GAUL. 03 87 36 90 55. Printed in Greece. Condition: Very good. There are a couple of loose pages. Printed in Greece. Condition: Very good. EO Editions Dargaud 1974. Uderzo and Goscinny Asterix 21 The gift of Caesar. very good condition (protected by a plastic cover that you can remove carefree). Germany, United Kingdom, Belgium, Luxembourg, Spain, Portugal, Italy.